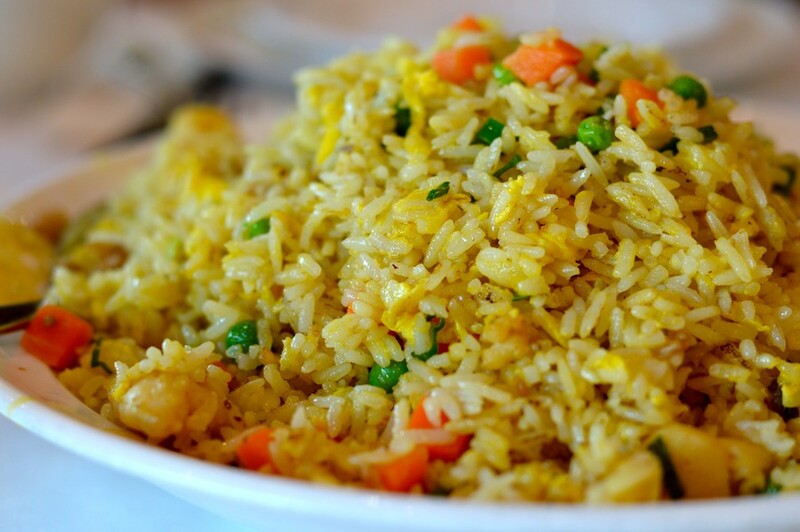 Cai's chicken and fish fried rice packs a salty surprise. The gentrified streets of Chicago’s Chinatown are little more than a highly belabored attempt at making the neighborhood authentic enough for nostalgia but palatable enough for Westerners. Countless restaurants of Lao this and Lao that seek to monopolize the food options, and the lack of stellar cuisine puts Chinese-Americans like me in the dilemma of combating our cravings for childhood fare with food from sub-par establishments. After vacillating back and forth on the quality of Chinatown’s offerings, I’ve decided that the grub does the job: we have nothing better, so we may as well get to like it. Cai is another addition to the Cantonese-headed restaurants that pose as staple Chinese institutions. It serves an overwhelmingly varied menu that features southern Chinese cuisine mixed with internationally clichéd dishes like Beijing roast duck. Xian Yu Ji Ding Chao Fan (Salted fish and minced chicken fried rice, $9.99): Definitely not for the weaker palates. For the inexperienced, the fragrant chicken fried rice is all fun and games until you bite into the aggressively funky salted fish. Jiao Yen Yu Pian (Deep fried fish fillet) ($9.99): The batter wasn’t too heavy and the medley of garlic, chilies, and scallion took me back for a short-lived moment of nostalgia, as the dish definitely packed on the MSG. Lobster (Hong Kong style) (MP): Don’t waste your $35 on this hot mess. Chicago suffers from being in the middle of the country, and picking out flesh from this lobster was unrewarding. Cai’s business model is much like that of Phoenix Restaurant and other predominantly Cantonese restaurants: serve dim sum, then a vastly varied dinner menu that caters to the Westerners who want to feel “exotic” as well as to the Chinese who just want to grab their favorites for the occasional night out. Don’t get me wrong, if you visit Cai often enough with large parties, you may foster relationships with the staff—the best part of being a dedicated diner at a Chinese establishment, with benefits including off-menu regional gems, a massive upgrade in service, and occasional complimentary alcohol. The staff is undeniably Chinese, but forced to cater to non-Chinese for economic survival, which is the overwhelming theme of this neighborhood. Fu Qi Fei Pian, a cold appetizer, is tasty when dressed in moderation. Lao Sze Chuan’s food pretty much has the same flavor profile. The staple combination of garlic, chili oil, dried red chilies, ma la oil, and cilantro forms the foundation for countless hot and cold dishes in the region of Sichuan. Eating through a meal of Sichuanese food is not recommended for people who can’t take their spice. I found myself in a good amount of pain, though I had grown up on the cuisine. Ask politely for less spice; you’ll only be mildly judged. Order plenty of rice to survive the inevitable hell. Fu Qi Fei Pian ($6.95): This cold appetizer of strips of beef tendon and meat, garnished with fresh cilantro, is one of my favorites. But this serving was too overwhelmed with ma la for my tastes. La Zi Ji ($11.95): The badass cousin of Gong Bao Ji (Kung Pao chicken), La Zi Ji is a simple, dry stir-fry of chicken and red peppers. Don’t make the mistake of eating the actual dried chilies; they’re just for fragrance. Spicy Stewed Pork Intestines ($11.45): One of my particularly adventurous photographers ordered this dish. They are unsettlingly chewy, allowing you plenty of time to think of what has passed through them. Beware. Shui Zhu Yu ($14.45): The quintessential hot Sichuan dish contains unctuous pieces of white fish fillets in a diabolically spicy soup with plenty of stewed cabbage. Ours was served with an unappetizing, thick layer of chili oil, but the fish itself was perfectly cooked. Smoked Tea Duck ($14.45): This non-spicy dish featured pleasantly smoky, crisped skin. The fat was well rendered and the duck was slightly stringy but compensated more than enough in flavor. Though relatively authentic, Lao Sze Chuan is mediocre in its execution. 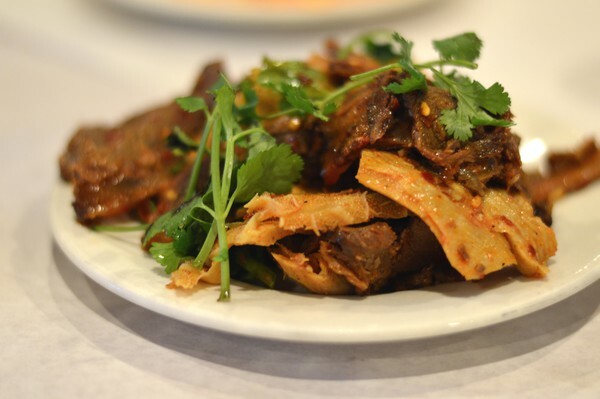 It is by no means comparable to the Sichuanese joints that have a clear understanding of the balance of garlic, chili pepper, and ma la, as well as more focused menu offerings. Like Cai, Lao Sze Chuan degrades its quality in attempting to cater to everyone. Its place in the empire of restaurants—including Lao Hunan, Lao Shanghai, and Lao Beijing—is a deliberate attempt to feature the major cuisines in China and stuff them into one neighborhood, and it’s overwhelming. Chinatown’s faux authenticity gives you just that: an experience that’s more of an illusion. The strip on Archer Avenue of what vaguely resemble Tang Dynasty buildings irks me as plasticky, much like the recently built Qi Bao Lao Jie in Shanghai that is unquestionably aimed at foreign tourists in the name of exhibiting ancient Chinese culture. It feels superficial—the quintessential aspects of a vast and rich history plucked out to cater to an era of diners who want to feel like they can travel the world without leaving their city. Perhaps next quarter I can head up to the northern suburbs like Naperville and Skokie to touch ground with their Chinese-American communities.